The Cocopah Indian Tribe is one of seven descendant Tribes from the greater Yuman language-speaking people who occupied lands along the Colorado River. Cocopah Tribal ancestors also lived along the Lower Colorado River region near the river delta and the Gulf of California. The Cocopah people had no written language, however, historical records were passed on orally or interpreted in documents written by outside visitors. Diaries and journals kept by travelers along the Colorado River and migrants into the West documented the Cocopah people. Spanish explorer Hernando de Alarcon, a member of Coronado's marine expedition, traveled the river in 1540 and described members of the Cocopah Indian Tribe as tall, well-built people who carried wooden maces and bows and arrows. The men wore loincloths and the women wore willow bark skirts. The explorer and his crew were offered gifts of shells, beads, well-tanned leathers and food. 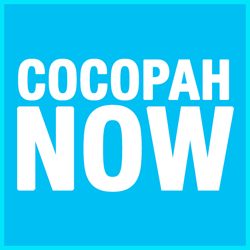 When Don Juan de Onate and Father Escobar sailed up the river, there were estimated to be about 6,000-7,000 Cocopah people living along the delta and the lower Colorado River. Fellow travelers, such as Father Kino, Father Garces, fur trapper James O'Patte, military men and ethnographers, kept colorful records from 1540-1917. Westward expansion in the 1840s and the discovery of gold in California in 1849 brought many migrants through the area near the mouth of the Colorado River and the Grand Canyon region. The strategic importance of the river crossing was recognized by the U.S. government, and the United States Army established Camp Independence in 1850 to protect the entry route through the tribe's territories. The following year the camp was moved to the site of an old Spanish Mission later named Fort Yuma, which still stands today. Throughout the mid 1800s and early 1900s, the Cocopah Indian Tribe effectively resisted assimilation to an established reservation and maintained its social, religious and cultural identities. In the last half of the nineteenth century, the steamboat business became important to the Cocopah people. Cocopah men, known for their skillful river navigating, were valued pilots. President Woodrow Wilson signed Executive Order No. 2711 in 1917 which established the Reservation. In 1985, the Cocopah Tribe gained an additional 4,200 acres, including the North Reservation, through the Cocopah Land Acquisition Bill signed by President Ronald Reagan. The Cocopah Tribe of Arizona is comprised of three noncontiguous bodies of land known as the North, West and East Reservations. Today, the East, West and North Reservations comprise over 6,500 acres, much of which is leased as agricultural land to non-Indian farmers. The Cocopah Reservation is located 13 miles south of Yuma, AZ, and 15 miles north of San Luis, Mexico, in Yuma County along the Colorado River. The reservation's unique geographical location borders the United States, Mexico, Arizona and California. Historical records show that the Cocopah domain once included portions of Arizona, southern California and Sonora, Mexico. The Treaty of Guadalupe Hidalgo divided the U.S.-Mexican border and the Cocopah lands between the two countries in 1848. Since 1930, the Cocopah (U.S.) and the Cucapá (Mexico) peoples have been forced to end Tribal unity. In 1964, the Cocopah Indian Tribe founded its first Constitution and formed a five-person Tribal Council. 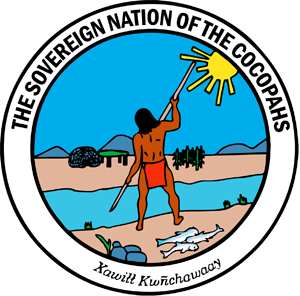 The Cocopah Tribal Seal, similar to the U.S. flag in America, represents the sovereign Cocopah Nation. As recently as the 1960s, a number of tribal families lived in traditional arrow weed-thatched homes, and until 1968, there were few houses and gravel roads. In the late 1970s and 1980s, the Tribe began acquiring additional land, constructing homes, installing utilities, developing an infrastructure system and initiating economic development. The hexagonal Tribal Administration Building was completed in 1976. Currently, there are about 1,000 enrolled Cocopah Tribal members who live and work on or near the three reservations.